How do I buy a Big Frog Custom T-Shirt Franchise? 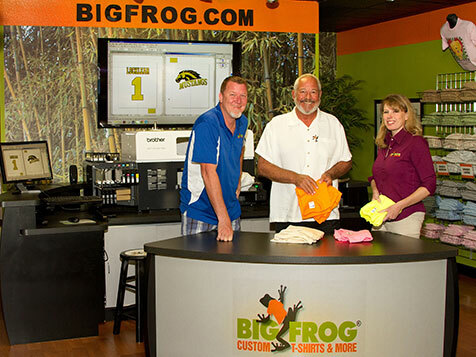 Big Frog is a high-tech, light manufacturing retail business looking to expand its footprint with qualified business investors. 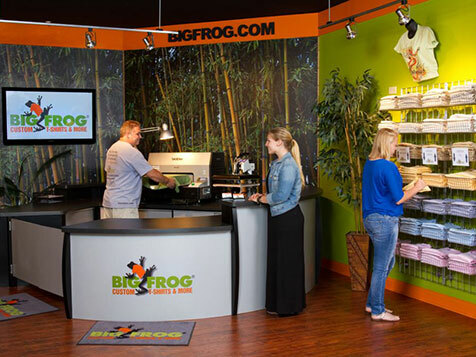 To buy a Big Frog investors need $39,500 for the initial franchise fee, $50,000 in working capital and an additional $100,000 to cover other costs related to build out, in-store items (fixtures, equipment, signage, inventory). Training is provided. Have fun everyday with this opportunity. Few employees, designated territories, green technology. Big Frog is more than a Business, it’s a Lifestyle. Big Frog is looking to grow this incredible brand to 300 stores by 2020. If you’re looking for a really FUN & simple business and you want to follow your passions, be an active part of your community and truly give back to worthwhile causes and groups, take a closer look at Big Frog! 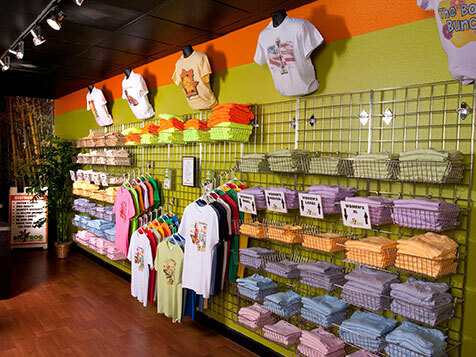 Big Frog Custom T-Shirts & More started franchising in 2008 with the first store opening in the Tampa Bay Area that fall and now has over 64 locations in 23 states. Make custom T-shirts and memories for your customers using photos, text, logos and clip art with cutting-edge digital printing process. Providing an AMAZING customer experience will take you far beyond satisfying customers to building permanent FANS! Open Big Frog Custom T-Shirt in any of these available states: AL, AZ, AR, CA, CO, CT, DE, FL, ID, IL, IN, IA, KS, KY, LA, ME, MD, MA, MI, MN, MS, MO, NE, NV, NH, NJ, NM, NY, NC, OH, OK, OR, PA, SC, TN, TX, UT, VT, VA, WA, WV, WI, WY, DC. NEVER UNDERESTIMATE THE POWER OF A T-SHIRT! Customers love Big Frog because we offer NO MINIMUM QUANTITIES – NO SETUP FEES – NO ARTWORK CHARGES and 24-HOUR TURNAROUND - NO KIDDING! Our stores are garment decorating consultants; we offer just about every decorating technique and can handle orders of any size. We entertain our customers, help them with their designs and make sure they have a lot of FUN! Will Big Frog be right for you? 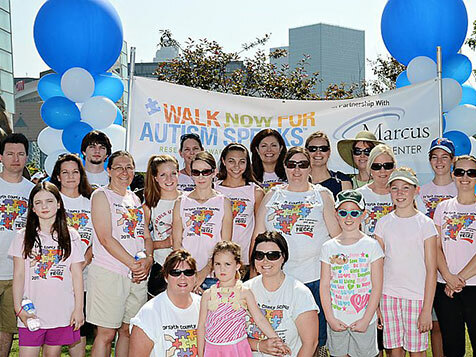 Our best franchise owners are outgoing and friendly and want to have lots of FUN! They have some business experience and can follow a system, with marketing and team-building skills being especially useful. They like to meet people and want to be an active part of their community. 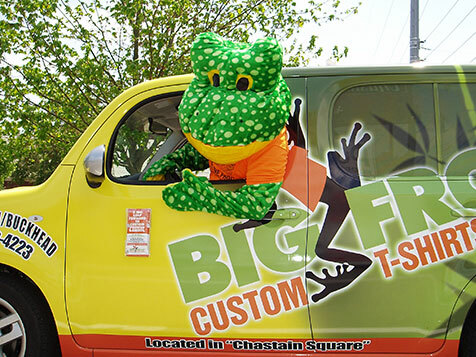 Franchisees love Big Frog because our small retail boutique stores are only open daylight hours 5 and ½ days a week, and have 2 or 3 high-retention employees, minimal inventory, no accounts receivable and 65+% profit margins on 6 revenue streams! We participate in the VetFran and DiversityFran programs and offer discounts to encourage franchise ownership by these folks. Recent recognition and awards include: #24 Lowest Risk Franchise Investment by FranchiseGrade.com, Top 500 Franchise by Entrepreneur Magazine, Top 200 Franchise by Franchise Times and Top 50 Franchises for Franchisee Satisfaction by Franchise Business Review for the 4th year in a row. As a member of The Big Frog Family, you and your staff will get comprehensive training including eLearning courses, Big Frog University in Florida, webinars and videos, weekly coaching calls and our annual Frog-A-Thon franchise convention. Our proven community networking and marketing programs include a store website, social media, bi-monthly e-mail blasts, a wrapped vehicle, T-shirt giveaways and lots of community involvement. EVERYONE IS A PROSPECT, EVERYONE WEARS T-SHIRTS! Our market opportunities are endless. We sell to schools and clubs, churches and civic organizations, charities and philanthropic organizations and to businesses for their employees and promotional opportunities. Join our terrific family of friendly franchise owners who will help you build your new business with peer groups, internet forums, an active Franchise Advisory Council and much more. SBA financing and qualifying retirement plan rollover programs are available through terrific outside vendors. WHERE FUN IS ALWAYS CELEBRATED! Big Frog Custom T-Shirt is not currently active in our directory, but here are some other recommended selections for you to explore.